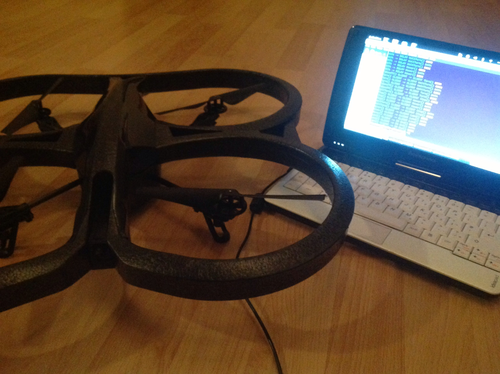 The Parrot AR.Drone is quite a lot of fun, and also quite hackable. 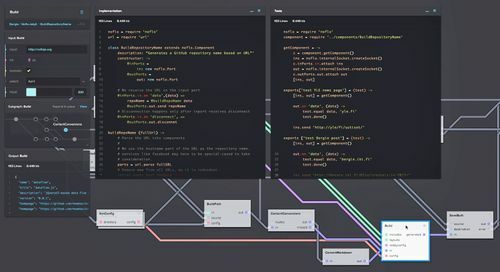 We recently got one, and the first thing to do was to connect the excellent Node.js ar-drone module with the NoFlo flow-based programming framework. While quite a lot of work remains, it was already very satisfying to see how the drone was able to fly patterns based on the NoFlo graphs we created. This will obviously be more interesting when we have the rest of the motion commands implemented, and can start reading the output of the various sensors on the drone to make it react to its environment. Also interesting would be to connect this to the various other NoFlo libraries so that the Drone could be controlled by other protocols, or could react to things happening in other web services. You can see some example flows in Susanna’s droning project. The NoFlo Kickstarter reached 100% of the funding goal this morning! Now that things are going smoothly there, I can focus more on this and other examples. Stay tuned!